Are You Brave Against the Cougars? – The heart opens. Are You Brave Against the Cougars? Of all the doggy prisoners that summer, the brown and black dog was the one. He brought her home because she acted reasonably indifferent, in contrast to all the crazed dogs barking and jumping and carrying on. She was a bony little thing, prone to destroying anything that would yield to her teeth (bike helmets and automobile upholstery, for instance), and barking excessively at the broom. Most importantly, she had very big ears. One that stood up straight, and one that lopped over. Except – every once in a while, both would stand up, and then she looked like a ridiculous bat-type dog. She lived with him, and then with “us”, and then with “all of us”, for a remarkable total of 14 years. She came home the summer of 2001, and she went off from us this week. We think she was 15. But mostly, we will no longer have her come to us, with her big wide forehead, and push it against us. We will not be able to work our fingers into her thick neck fur for a proper dog scratching. We will not be able to know when I am “right” in an argument, because she will not come lay by my feet. Visitors will not be greeted by her exuberant barking and jumping, right onto their crotches, with her perfectly measured nut-punch. And dogs all over the U.S. will no longer be dominated by her “I don’t know I’m smaller than you” ways. 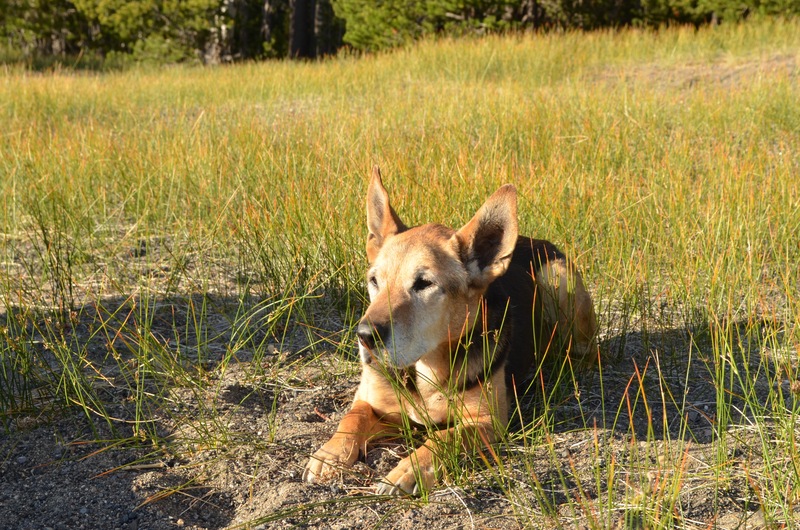 She will no longer inspire little boys to raise a stick in the air and yell out, “Brown dog, are you brave against the cougars?” before tearing off together on a big plot of land outside of Prineville. And it’s just about intolerable. Sort of like a flu, but without the fever. Ryan got to spend a few days alone with her, right up to the end, which is fitting, because in the beginning, it was just the two of them. And the kids are leading the way, with their dynamic kid-style grief, where they are happy and nonplussed, or entirely, ferally swallowed up by the gravity of emotions they can’t even begin to understand. We covered her with flowers and fruit and leaves, and sent her off in this blanket made of the yard she ruled – sunflowers, grape leaves, lavender, a bright orange tiger lily, radish blossoms, grapes, gooseberries. She has joined her long lost buddy, Tanner, out in the great unearthly question mark. Many family members pondered them out chasing things together, which makes me smile. I like to think of them out eating gross stuff together. Today I wrote another post, about letting go. The truth is, I don’t like it that she’s gone. None of us do. The routines of dog care start, and punctuate each day. They create order. Cole would let her out. Riley would feed her. They’d usually have a fight at the door. She’d go to each bedroom for the kids’ nighttime routines. Then she’d settle into her bed, until it was time to go out for that last visit to the yard. There is a quietness in these moments now, that will soon fill in with something else. But today, Cole took her wooden box out to the yard with Daddy, and they carefully spooned a little bit of her into his play dirt, where he escapes into worker-guy machine land. He got his favorite rake, and worked the dust in, and that is how he is working it through, creating permanence in her absence, and keeping her right in his heart where she belongs.